As a tenant, you should never sign a lease when you are not comfortable with every word. Even as a jaded, but experienced landlord, I would never sign a lease I wasn’t comfortable with. In the beginning, this was something that was stressed to me over and over as a new landlord. Tenants trying to negotiate the lease after it has been signed. Tenants not following the lease. Tenants who constantly request that the landlord fix repairs that should be tenant’s responsibility. It appears that 85% of all landlord’s complaints fall into those three categories. Over the years I have provided my thoughts to other tenants. In my experience and view, I have found that their issues revolve around these three things. Upset that the landlord won’t renegotiate the lease. Upset over actions the landlord is requiring from the tenant, but are supported by the lease. Upset at a landlord’s unwillingness to complete an upgrade or non-required repair or a repair that is the tenant’s responsibility. As a landlord, I am finding out the hard way that the importance of not agreeing to something that you do not agree with in every way is not known to the average tenant. This makes sense since in this day in age, everything exists as a “terms and conditions” statement. Well in the world being a tenant, life is the exact opposite. You are able to negotiate and eliminate and you should! I decided to put together a list things that you can find in different types of leases. I then put the questions beside them that you should ask yourself before agreeing to the terms and signing a lease. 1. Reverse Military Clause. Are you okay if the landlord breaks the lease because of military orders with no compensation other than orders? 2. Break Lease. How can you break the lease? 3. SCRA. Is the federal version of the SCRA in the lease or does the state have a more specific version? 4. Pest Control. Who is responsible for pest control? 5. Repair Deductible. Are you responsible for the cost of any repairs? 6. Maintenance: Tenant is Responsible For (Smoke Detectors/Alarms/Fireplace). What maintenance are you responsible for under the lease? Are any of these annual or semi-annual inspections? 7. Utilities Tenant is Responsible for. What utilities are you the tenant responsible for under the lease? 8. Rent Due Date. When is the due date? If it needs to be sent by mail, does the rent need to be received on the date or postmarked by the date? 9. How to Transmit Rent. How should the rent be submitted? mailed, direct deposited, pay pal, etc? 10. Late Fees. What is the late fee? How is it assessed or how does it accrue? 11. Landscaping Responsibility. Who is responsible for landscaping and what is that definition as defined under the lease? 12. Pet Deposits/Rent. What are the pet rules and requirements? 13. Month-to-Month. Is there a premium if the lease goes to month-to-month? 14. Automatic Lease Renewal. Does the lease automatically renew? 15. Notice Required for Terminating Lease. What is the notice requires to terminate the lease? 30, 60, or 90 days? How does that notice need to be provided? Does it need to be written? 16. Professional Cleaning. Are you allowed to clean the house yourself in a professional manner or must you hire a professional cleaner? If you are required to hire a professional cleaner what are the requirements (license, bonded, specific company, etc)? 17. Satellite TV. Does the lease allow dishes to be installed? If yes, what are the requirements? 18. Steam Cleaning. Are you allowed to clean the carpets or are you required to have a professional clean the carpets? 19. Vents Cleaned. Does the lease require that the vents be cleaned? If yes, what is the cost to have them professional cleaned? 20. HOA Rules. What are the HOA rules? What are the penalties if the rules are broken? Will any warning be given? 21. Key Change. Who is responsible for re-keying the house? 22. Alterations. Are alterations allowed? If yes, what are the requirements? Liability? Cost? How will permission be granted? 23. Septic System. Is it a septic system? Are there any plumbing requirements or expenses on the tenants? 24. Renter’s Policy. 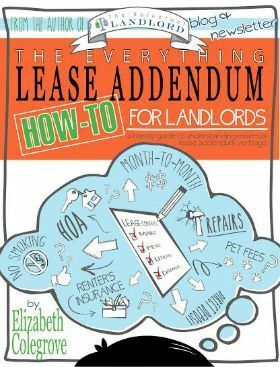 Does the landlord require a renter’s policy? If yes, what are the requirements? Liability? Pet release? Something else? While these certainly won’t cover everything that could come up, I hope this is a good start! 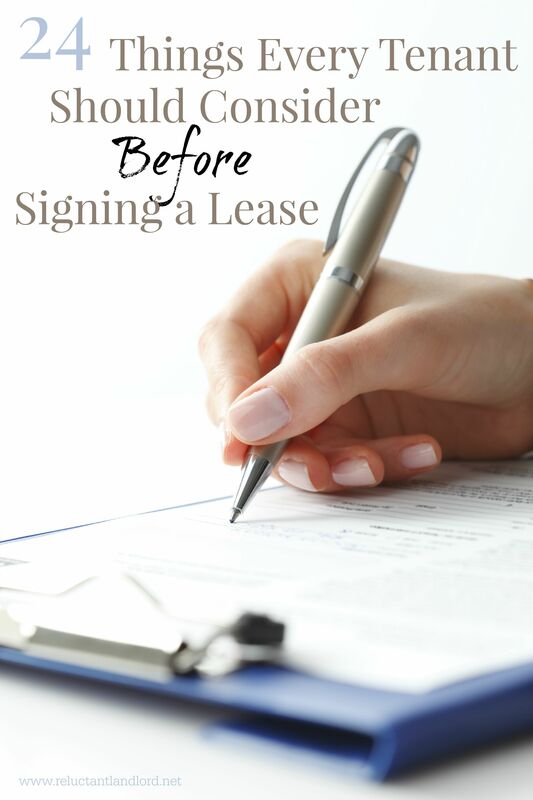 Just remember to allow time to negotiate the lease before it is signed. Once the lease is signed, it is a legally binding agreement. Did I miss anything? What has been your experience?